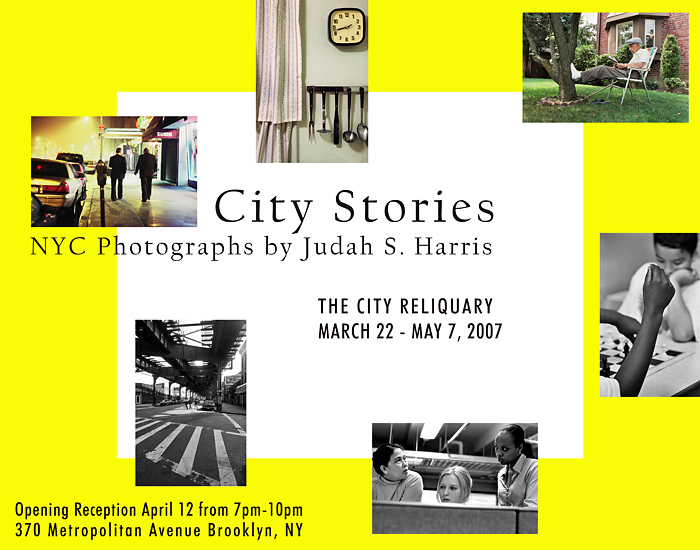 Your new photo exhibit at The City Reliquary in Brooklyn is called “City Stories”. Is there any special significance to the name? JSH: I had trouble coming up with a name for the show. I finally decided on this one. Of the 37 photographs on display, all but three of them are NYC scenes. It’s really a NYC show – that was the intent, and in keeping with the mission of The City Reliquary, a small neighborhood museum in Williamsburg, Brooklyn that’s been nice enough to host my work through the first week of May. Basically, the city has a lot of stories. Any place does, but if you ask someone to think of a picture of New York, usually they’ll imagine the iconic images of tall buildings, bridges, the Statue of Liberty, Times Square lights… All of that’s New York, and you only see that combination in New York, nowhere else, but I’m interested in the neighborhood or personal stories that unfold in our city. No tall buildings in your exhibit? JSH: Sure there are, but not a lot. One photo is called City from Above Looking South. 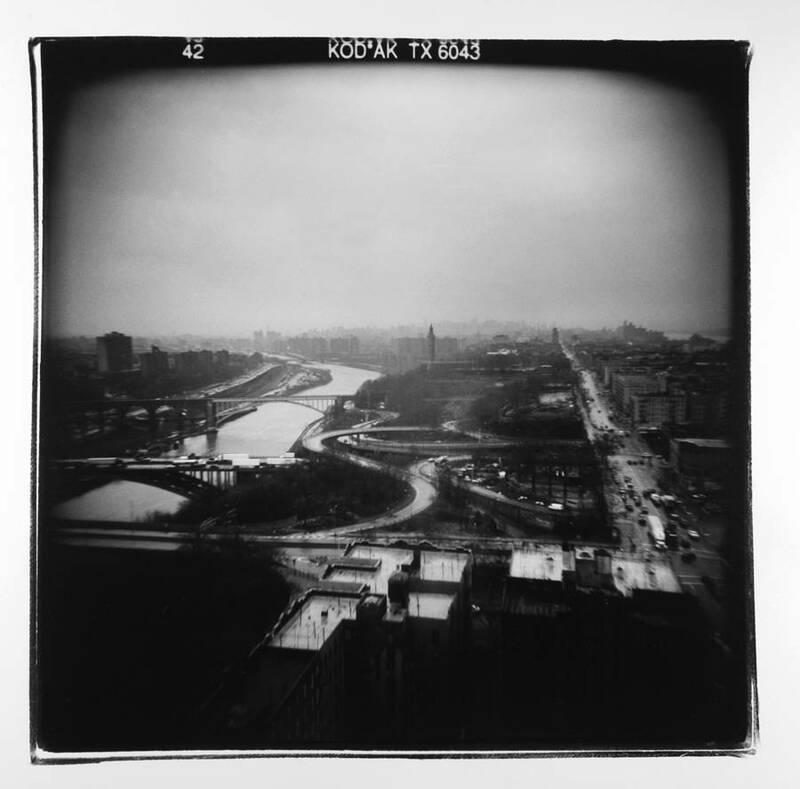 You can see a rare view of Northern Manhattan, Harlem, and even some distant skyscrapers of note. I took this photo from the 16th Floor of Yeshiva University’s Belfer Hall, the tallest building in Washington Heights and considered the highest point in Manhattan, since the Heights offers us the highest natural point in the city. I used to love going up there to see the view on all sides. You could look over to NJ, up to Yonkers, to the Bronx, and south to the city itself. I watched the Brooklyn Bridge Centennial fireworks in May 1983 from the same window. Not the best view, but could still see them. Are you a NYC photographer? JSH: Well, I’m based here. It’s my backyard, of sorts, though I’ve traveled elsewhere in the States and abroad. I have lots of NYC photographs from over many years of shooting pictures. When I use the term NYC, I’m including all five boroughs. I’m hoping to do a book. It seems there’s always room for another book, or maybe a monograph of NYC photographs, especially if it offers a somewhat different viewpoint. Have to get a publisher to agree. I guess The NY Times thought so. They published your work online last summer. JSH: Yes, the Times had a blog last summer about summer in the city. There were a number of featured writers commenting on the subject and they used five of my NYC photographs on a rotating basis to illustrate the page for the summer blog. It was nice exposure and I’ve had photographs of mine appear on the Op-Ed Pages over the years. The 50th anniversary of the State of Israel was one such occasion. They ran a montage of – you guessed it, 50 photographs I’d taken in Israel, mostly in Jerusalem. How does one get published in The NY Times? JSH: Basically you have to familiarize the appropriate people with your work, in this case the art director for the Op-Ed Pages. A good art director can match the right artist with the right project. The art director knew of my NYC photographs and liked them. About half of the photos in “City Stories” feature people - sometimes you show all of the person and other times only their hands or a portion of their body. Is this intentional? JSH: I don’t think I plan it that way. I focus on the broader scene and then will look for the details. Sometimes I do the reverse, though more often, I think, it’s going from wider perspective to narrower. I’d like to say that every photographer finds hands expressive, and of course the face, and especially the eyes are very expressive. A face can convey a lot, but hands can gesture and say something different than what the face can convey. In some of my photographs you see the faces and can also “read” the hands. I’m thinking of Dominoes, a group of Dominican men playing on the streets of Inwood. Boys Playing Chess is another real good example. 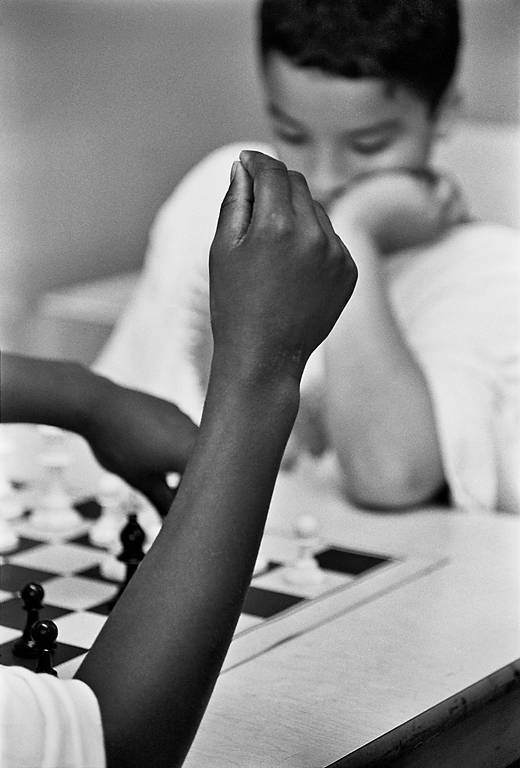 Look at the hands of both players and look at the expression of the boy further from the camera. He’s resting his cheek on the palm of his hand. Is he tired, disinterested, or is it contemplation? Another image shows a woman’s hands resting on her handbag, which is lying on her lap. Her hands are crossed. She’s on the subway and the positioning is sort of protective and possessive. Maybe I’m reading too much into it, but I wonder if the woman would rest her hands this way if she was in the comfort of her own living room. Since we’re discussing hands, where was the photo “Hands, Bolts and Tire” taken? JSH: That was down on the Lower East Side. It was an afternoon and I saw a man working on his car. His hands were all greased up and rugged. He was changing a tire, maybe more than one. I spoke with him briefly, though I don’t remember the details, just that I had a short conversation. If you’re putting the camera within two feet of someone, you sort of have to have a conversation. One of your photographs is surprising in a humorous way: a man with white socks is reading a newspaper on his lawn. His feet are resting on the trunk of the tree. JSH: The man is on his front lawn and the white socks really stand out. It’s the key ingredient of the photograph. Maybe from now on I’ll ask all my subjects to wear white socks - to insure the potency of every picture I take. Luckily they bundle them in packs of 12… I was walking home from the supermarket, actually, when I saw this scene right over the bushes. I had groceries and also my Nikon camera, since I had just finished giving a photo lesson. 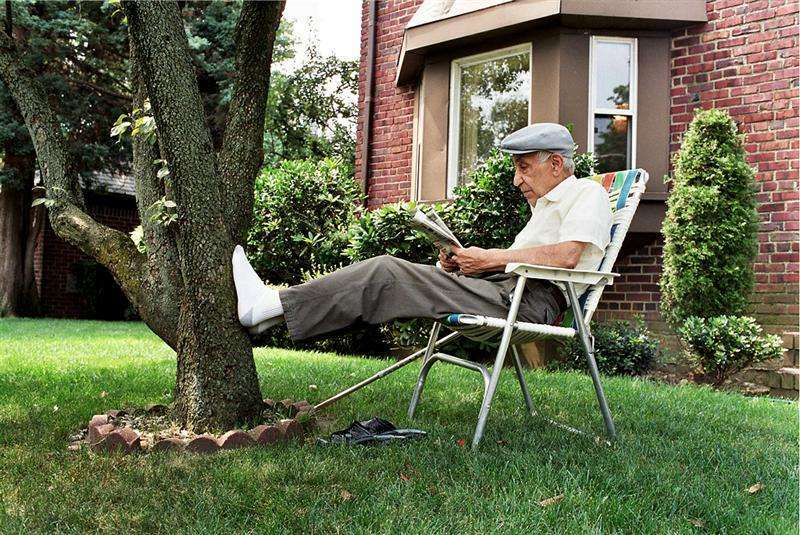 It seemed so natural, a man reading on his lawn, and yet we don’t think of older people assuming what is here almost a youthful stance, feet up on the tree. In school we tell young kids not to put their feet up on the desk, but here this older gentleman is really at home. It even seems as if he is supporting the tree, holding it up – and yet we see obvious signs of his age including his walking stick that rests right next to his folding lawn chair. So it's an unexpected story of sorts? JSH: I wasn't expecting it and that's the reason that I stopped to take the picture. The city is full of unexpected stories and I share some of them in this new exhibit. Judah S. Harris is a photographer, filmmaker, speaker and writer. His new exhibit, City Stories, is on display at The City Reliquary from March 22- May 7, 2007 and an opening reception with the artist will take place on Thursday, April 12 from 7-10pm. The City Reliquary is located at 370 Metropolitan Avenue in the Williamsburg section of Brooklyn, and can be reached at (718) 782-4842. The museum is open on weekends. Visit the museum website for further information and driving or subway directions: http://cityreliquary.org. For more information about Judah S. Harris' work, visit http://www.judahsharris.com.